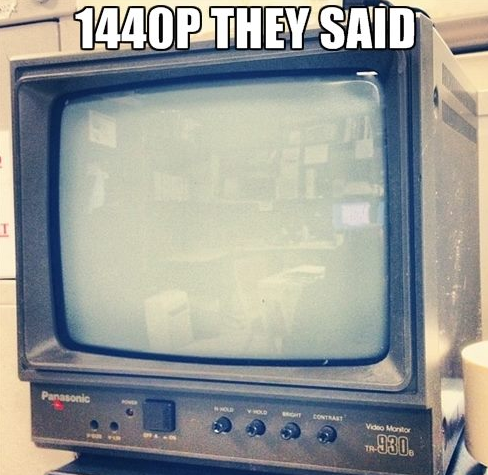 So right now I'm using a 21.5" 1080p monitor and am looking to upgrade. I have a budget of around $500-600 usd at most. I really like the idea of having two monitor workspaces so I need some opinions on what you think I should get..
One 2560x1440 monitor has the same pixel count as two 1920x1080 monitors. Personally, I'm a huge fan of the amount of real estate I get without any bezels separating my monitors. Up to you, really. Honestly, I'm a bit of a risk taker; I'd grab of the cheap 1440p Korean monitors from eBay. Picked it up from the store on sale for $220. Really nice. @Tyrone Would you happen to know what the difference between IPS and PLS would be? Is one better than the other or is there hardly a difference? Just to throw this out there, from wiki. IPS panels display consistent, accurate color from all viewing angles and without having any blur. IPS panels can process high speed signals without data loss by using copper wiring with low resistance values. IPS panels require up to 15% more power than TN displays. IPS panels are more expensive to produce than TN displays. Just buy the one that's best for you. Don't spend too much though. Would you happen to know what the difference between IPS and PLS would be? Is one better than the other or is there hardly a difference? You won't notice a difference, realistically; they're very similar. Below, you'll see a decent video overview on the various types.